-The Free Spell will be emailed to you by the time of the service. Please Leave your name and Date of Birth in the space classified as notes. Welcome to the April Full Pink Moon Community Service. This service is to cleanse, cut, clear and release personal issues or bad habits that keep us from obtaining our blessings. This is the time of year that truly set us up for success in the summer. April showers bring May flowers, let us use this time of the year wash away any bad conditions that could possible set us back from obtaining the full magnitude for success and abundance. This moon is also known as the egg moon too, within native tribes of this region. In hoodoo eggs are major allies for cleansing. The time of the year hold large significance to cleansing and this lamp will provide just that. 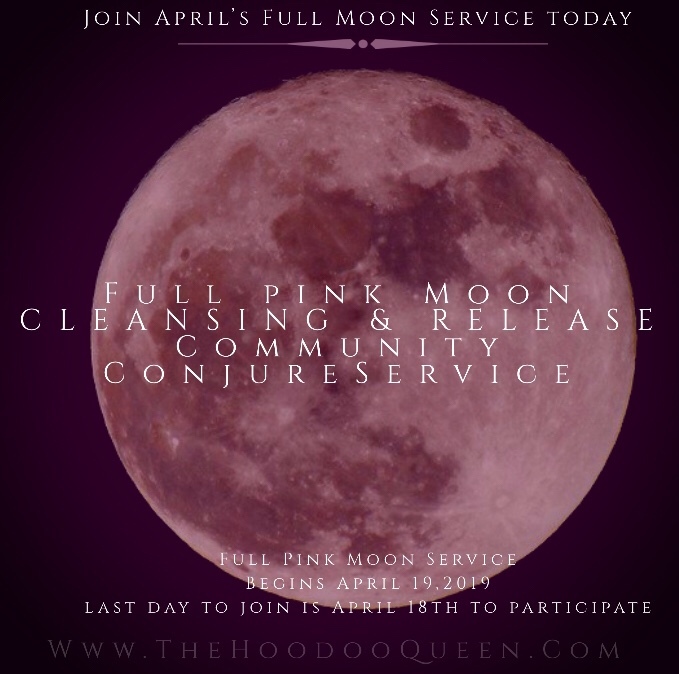 April 18th is the Last day to purchase this service. Soooooo Co. did the road opening community service and I’m overjoyed I jumped in when I did! The next day after the ceremony I received a random so very unexpected check in the mail for $79 and though it was small as The Dark Mother said…. Pay attention to the BIGGER PICTURE OF IT ALL! Watch great things unfold stay positive and get ready to receive no matter what it is and accept it! Thank you Dark Mother love you to pieces I can’t wait to see what’s next! I recommend anyone and everyone to take advantage of the next opportunity to get in on this or any community service it’s so worth it! I purchased one for myself and my partner. The first 2 days, the bs was sloughing off. I could feel it. Since then, we have received so many opportunities, new energy and clients for both of our businesses. Baby, your ase is on fire. Thank you Co love!